Brush asparagus with olive oil and sprinkle with salt. Grill over high heat until done; set aside. Season scallops with salt & pepper. Place saute pan over high heat; sear scallops about 2-3 minutes per side, depending on size. Remove from heat. To serve: Divide asparagus between 4 salad plates. 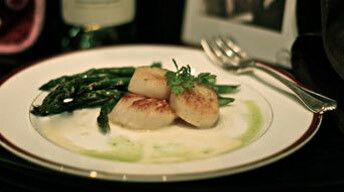 Place 3 scallops on each plate and drizzle with sauvignon blanc vinaigrette. Place wine in non-reactive saucepan over high heat and bring to a boil; reduce heat to medium and simmer until reduced to 1/4 cup. Place wine, Dijon, lemon juice and salt in blender. With blender running, slowly drizzle in oil. Season to taste with more salt.